Established: By Legislative Decree No. 163 of 4 July 1953. Awarded to all members of the armed forces and to civil servants for extraordinary courage and loyalty, for the performaance of services on behalf of the homeland, or for at least five years of sincere and faithful service. The award may also be presented to foreigners. Normally, the initial appointment will be to the lowest class, with successive appointments by promotion to the higher grades. 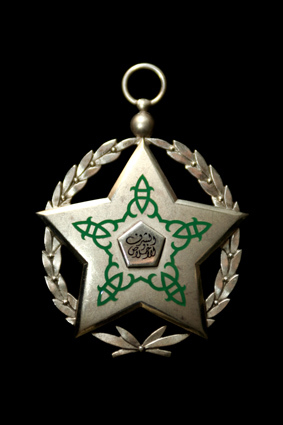 When awarded for bravery, the badge is surrounded by a wreath of olive leaves . Also referred to as the "Order of Loyalty" or the "Loyalty Medal". Obverse: A five-pointed star edged black and with an enameled light green design in the center, all within a wreath (for awards for bravery only). The size of the badge varies by class, as detailed below. In the center, there is an Arabic inscription in black "Honor and Devotion". The medal is either worn as a neck badge or suspended from an integral straight-bar suspender. 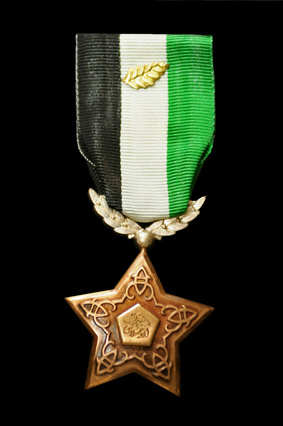 Reverse: A raised horizontal diamond with the Arabic legend "Syrian Republic"
Ribbon: Equal stripes of black, white, and dark green, left to right. Various devices are worn on the ribbon to indicate the class.